Now, I have nothing against the Mayflower Compact. And I’m a Protestant, which means that I don’t have the complexity of relationship with the Pilgrims that others do (even though they would consider me insufficiently Reformed because I am not a Calvinist.) And I couldn’t resist the picture. But on this Thanksgiving eve (with my yams roasting in the oven so that tomorrow I’ll just be able to heat them up and pour flaming Jack Daniels over them at the family dinner in New Paltz, New York), I want to draw your attention to another document. As founding documents go, it’s not even a B-list celebrity (the Mayflower Compact is a bit of a B-lister, actually; the Emily Blunt to the Declaration of Independence’s Emma Thompson; not less likeable, or talented, necessarily, but less well known) . No, this document is more of a road not taken: a piece of our heritage that landed on the cutting room floor. There shall be for ever hereafter, in our Towne of Plymouth, in the County of Devon, one Body politicque and corporate, which shall have perpetuall Succession, which shall consist of the Number of fourtie Persons, and no more, which shall be, and shall be called and knowne by the Name the Councill established at Plymouth, in the County of Devon for the planting, ruling, ordering, and governing of New-England, in America. It gave these forty men enormous rights over the area they were going to settle and the people who were going to settle there: they had the right to make and enforce such laws “as they in their good Discretions shall thinke to be fittest for the good of the Adventurers and Inhabitants there.” The laws had to be in keeping with the rights (as Englishmen) of both the “adventurers,” that is, the investors and traders, and the “inhabitants,” the settlers. But the company– a private and for-profit enterprise– was what was going to be making the laws. and all kinds of other goodies. And they were granted these things “in free and common Soccage and not in in Capite, nor by Knight’s Service;” that is, they owned these lands and goodies, they weren’t tenants, and didn’t have to serve in James’ army in exchange for the grant. It was this 1620 charter that the Pilgrims were under when, in 1621, they celebrated the first Thanksgiving. And then, 14 years later, the company that had been formed by the charter, that had all these rights to the land from which the Pilgrims were barely beginning to make a living– that company… dissolved itself. 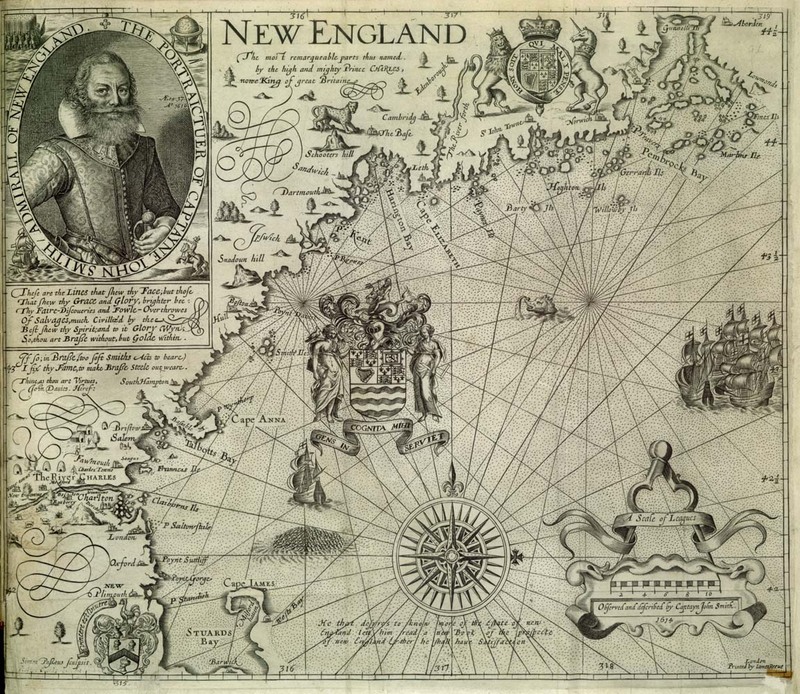 their rights over New England that they’d held under James’ Charter. They surrendered those rights, and they ended their existence as a company. [T]he immediate cause of the surrender was the odious extent of the monopolies granted to them, which roused the attention of Parliament, and of the nation at large, and compelled them to resign, what they could scarcely maintain against the strong current of public opinion. ***Superbly*** well researched and delivered. Your humor and tone are welcomed by the way (“can’t stop the signal” — pffff!!). Subscribing! I’m at noyesancestors at gmail dot com. Cheers!